Free Gift Product extension allows you to automatically add a product from the list of gift products based on specified criteria. The extension gives you the flexibility to add a list of gift products and the cart total amount required to be added as gift. The extension also supports multiple currencies as well. Note: Domain Name(s) should be without http:// and www. If your domain name is www.example.com then use example.com . With Free Gift Product extension you can increase your sales by allowing customer to get gifts on purchasing more. The Free Gift Product extends native Magento functionality with an ability of automatic product adding to the cart. An item appears in the shopping cart based on set criteria. The extension gives you the flexibility to add a list of gift products and the cart total amount required to be added as gift. If you are running multiple stores or website you can vary your criteria and gift product as well. The extension also supports multiple currencies as well. It automatically updates the gift product criteria based on currency conversion. 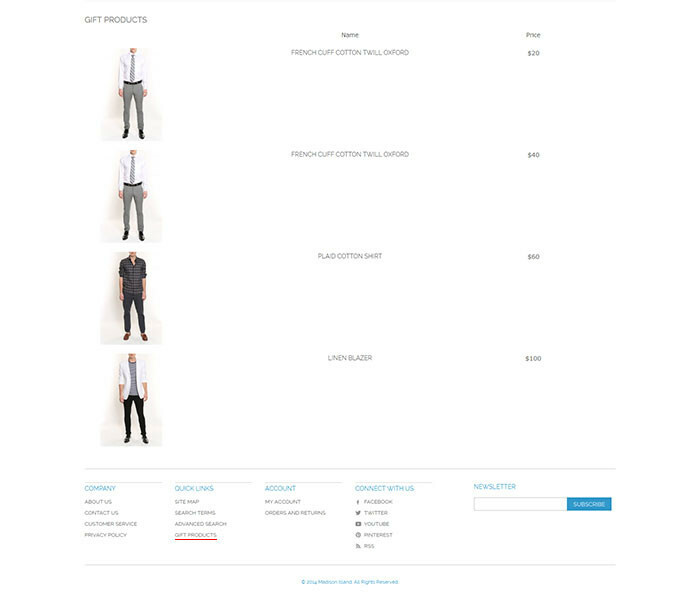 There is also a page in frontend that shows customers the list of gift products with required cart total for it to be added in shopping cart. Latest release is compatible with all magento CE security PATCH. Free Gift Product Extension - How To Install? Before installing go to the menu System -> Tools -> Compilation and Disable it! Install extension by copying the extension files to the folder where magento is installed. After installation clear cache, logout and then login. If you want to enable Compilation, go in the same menu as above, and Run Compilation Process. Go to System->Configuration. 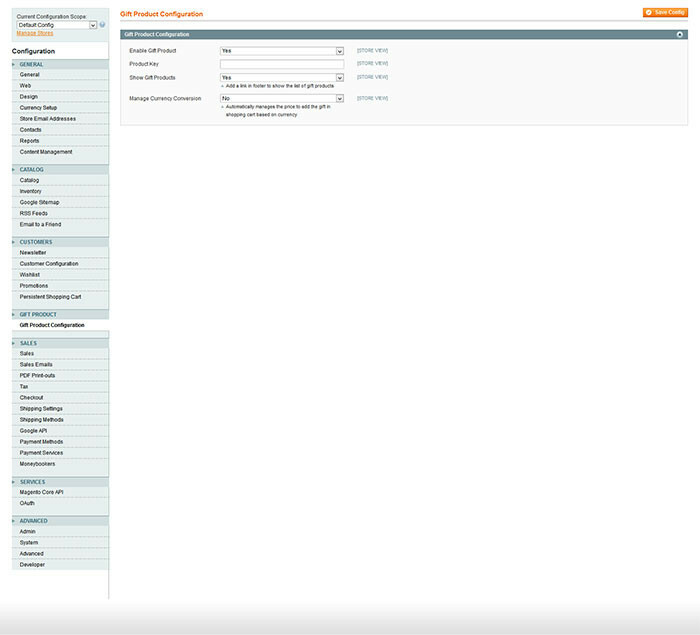 Click on Gift Product Configuration from left bar. Enter valid License Key. Select Yes to enbale gift product module in frontend. Click Gift Product->Manage Gift Products from top menu navigation. 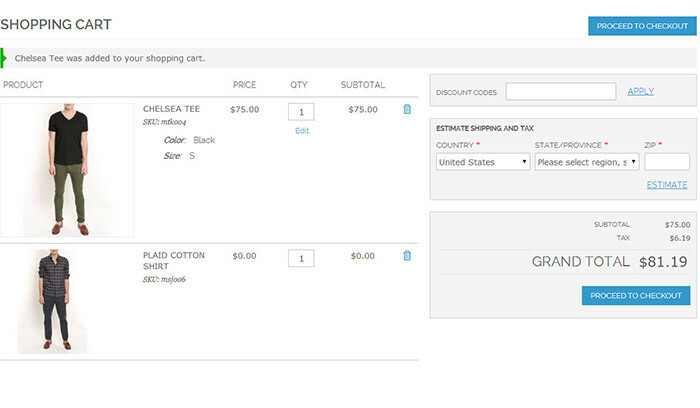 Add the gift products and cart total required for each to add the product in shopping cart. A very good extension to add free product. Cost effective & easy to use. This extension is very useful if you want to give your customers a free gift depending on cart amount. Request to support team was answered very quick. Great Extension, works how it should and a really fast support! The extension settings and gift product management is very easy and flexible. I love the way how currency conversion works for adding the gift product. Best Gift Product Extension among so many available in magento connect. Really works like a charm for me. Ideal "Free Gift" extension, which can be configured quickly via the CMS. Easy install when I knew what I was doing with the help of the support I got from the company. Maybe the next update will be that you can select more products for free or make more rules. Also define if you use multiple shops. Great extension! Works like a clock for me on CE 1.8.1.0. + Great support. I installed the extension well, but it was not visible on the front end. One mail to the developer and he response very quick and help me to understand the extension and ... it works perfect. This is amazing extension. I have found this extension best for promotional gift. I have installed this extension easily and found very easy to use as well. Nice extention as provide in the features. It's a very useful extension. I am very happy with this extension and its flexibility. Copyright 2009 - 2019 Red Apple Solution Limited | All Rights Reserved.